After over ten years of pedaling, our old washing machine finally threw in the (freshly laundered) towel - it had sprung a leak which could not be repaired. Some years previously I had actually managed to get hold of a top-loading machine from the local tip, this machine had been dumped due to electrical failure but the mechanical parts were in good working order and it was watertight. 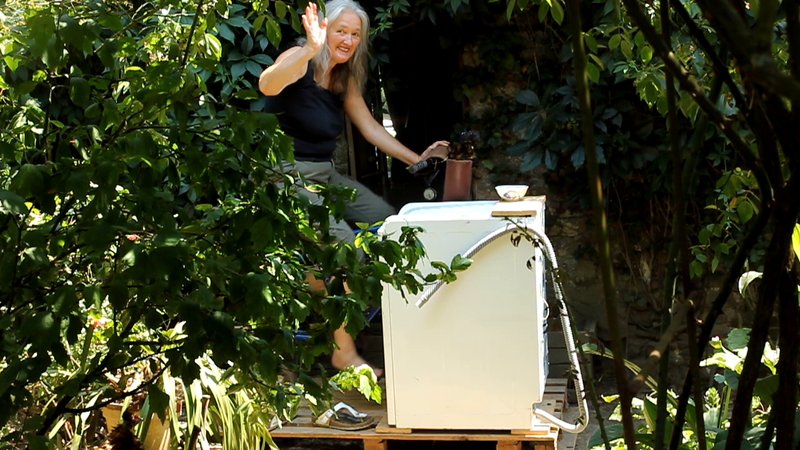 I have also had several comments from subscribers asking for a step-by-step description of the conversion of a washing machine to pedal power and so I decided with this new project, this was a great opportunity. My mind was further also focused on the task by having a request from our local organic shop to exhibit our pedal powered washing machine during 'Do-it-Yourself Week'. In this new project and also not to exclude those without welding equipment I decided to make wooden supports for the bicycle. 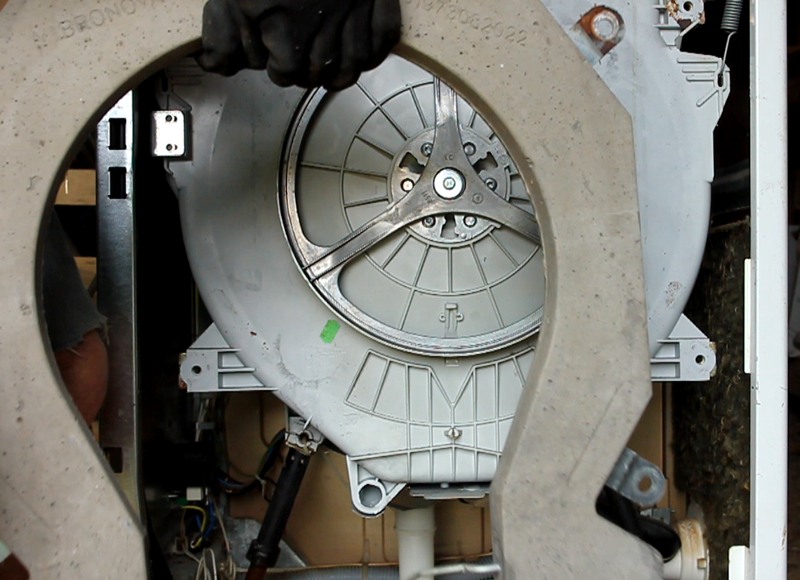 The most frequent reasons for machine failure is of an electrical or electronic nature. 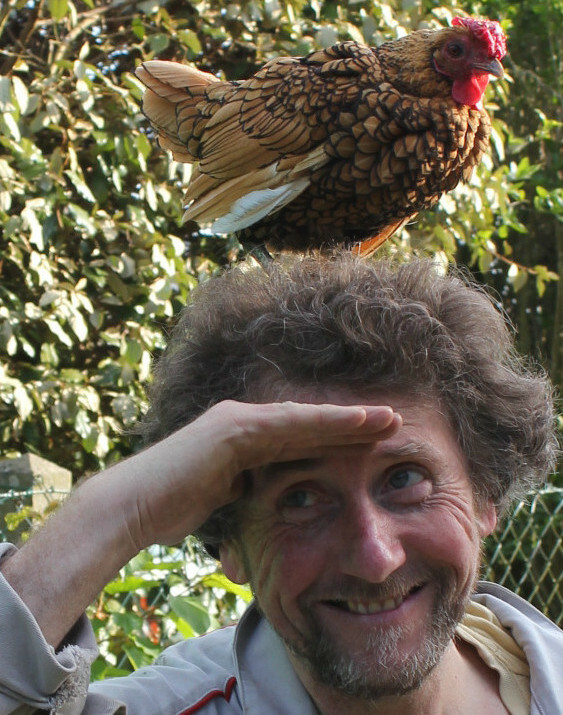 Neither of these preclude using it, as long as the drum is watertight. Even if you don't already own a machine I can guarantee that one of your neighbours, friends or family has at least one of them in their garage. Due to the heavy nature of these beasts, most people choose not to dump them but to leave them alone hoping that one day someone just like you will come along. The good news too is that you won't need all the heavy stuff, so you will be able to remove it with impunity before loading it up. In the next article we will go into detail on what to remove. What better way to do the laundry than peddling in the garden on a sunny day! Below: Have Washing Machine will Travel - a whole new career as an ambulant laundryman has opened up to me! Before we start with the hands-on conversion we should familiarise ourselves with the configuration of the drive train of our own machine. This might sound complicated but in essence, this just means 'what makes the machine go round' and we need to know this so that we set up the machine and the bicycle on the correct side. 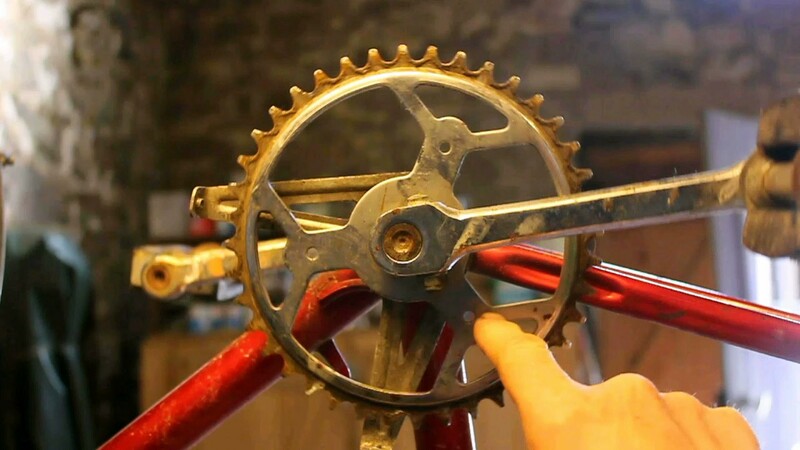 Our bicycle is going to power the machine via the chain and thus a chain wheel (sprocket) will need to be attached to the side of the washing machine drum which was originally driven by the electric motor. In the case of a front-loading machine, the drum is driven from the rear, so the bicycle is placed behind the machine. 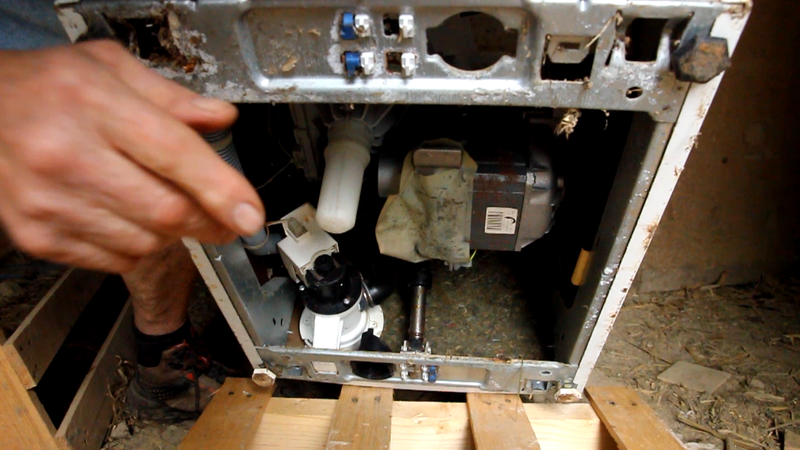 On a toploader, it is less evident and so we need to determine where the washing machine's transmission is located. This is done simply by tipping it up and looking underneath. Once we know where the drive is, we can establish which way round the machine will have to face for the drive to function. Here below in close up you can see the motor on the right of our machine. In order to create a neat laundry set up, that functions well, looks good and can be moved and relocated efficiently, I made this design to fit on a standard European wooden shipping pallet size 140 x 80 or 55" x 31½". These pallets are normally readily available but if you can only find the standard US size grocery pallet of 42" x 40" then join two of these together and saw off any excess to neaten. Using a pallet means that if, as in our case, you would like to use the machine in the garden or where there are uneven surfaces, the two machines will always be on the same foundation. Plus, the additional height provided by the pallet makes it much easier to drain the water from the machine. Living by the seaside means that we have a plethora of discarded materials that holidaymakers leave behind, usually around the recycling bins. This includes everything from furniture and bicycles to kittens and dogs! As people around here are great recuperators, this means that everything including the pets get rehomed. Here below you can see our latest crop of bikes, on a bumper day we can get four or five at one pickup point. When choosing a bicycle to power your washing machine, remember that you do not need tyres or even wheels! The bare essentials would be a comfortable seat, a sturdy frame, handle bars, pedals and chain - a bell is fun particularly if you are expecting kids to help with the laundry! In addition you will also need a second chain wheel (see left) and an additional length of chain. This is another reason to collect a couple of bicycles before you start your conversion. Remember that additional and unused components maybe of use for other projects or repairs. 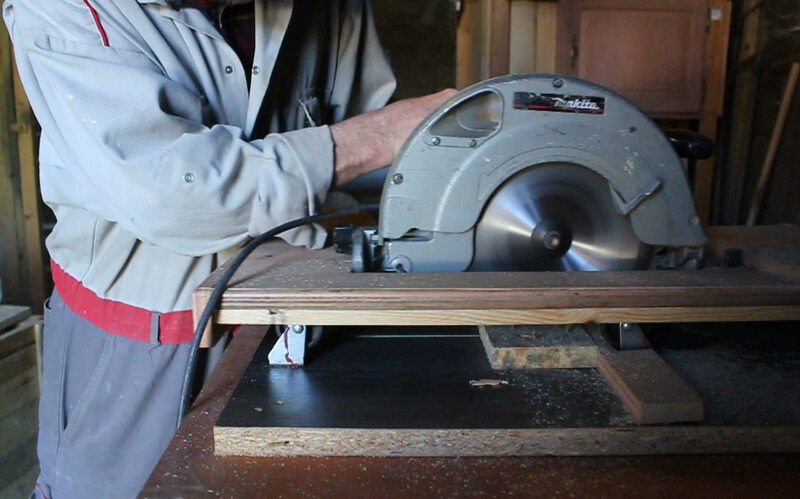 All the work involved in this conversion can be achieved with hand tools but it might be a good idea to invest in at least one power tool just to save time and effort. I work on the premise that tools are a great investment and that if you are going to consider DIY then they are essential. Similarly Safety Equipment is also a necessity, in particular when handling heavy objects and using power tools. Buying these items has an initial outlay but if you buy wisely these will last you for years of projects, for example my current electric drill is well over ten years old. In the next article I will be looking at taking the machine apart, removing and the initial stages of the conversion to pedal power. Please feel free to share this article, comment and/or ask for further information. Very nice post, thanks for sharing it with us.